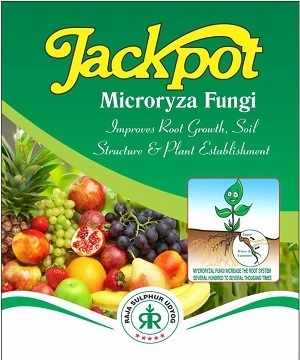 JackPot is an innovative bio fungi used in soil. Jackpot contains a friendly MYCORRYZA fungi which facilitates the required nutrients from the soil to the roots of the plant. It increases the health and growth of the plant substantially. JackPot also contains required food and adjuvants for the growth of the fungi. JackPot is water soluble. It can be used by drip irrigation, spray or mixing with organic manure for soil. Cover the JackPot mixture with soil after application on farm. Appearance: Dry water soluble Powder. Packing: 200gm. pack and bulk 25kg. bags.